*These statements have not been evaluated by the FDA. This product is not intended to diagnose, treat, cure or prevent any disease. The information provided on this site is for informational purposes only and is not intended as a substitute for advice from your physician or other health care professional or any information contained on or in any product label or packaging. You should not use the information on this site for diagnosis or treatment of any health problem or for prescription of any medication or other treatment. You should consult with a healthcare professional before starting any diet, exercise or supplementation program, before taking any medication, or if you have or suspect you might have a health problem. You should not stop taking any pharmaceutical product without first consulting your prescribing physician. 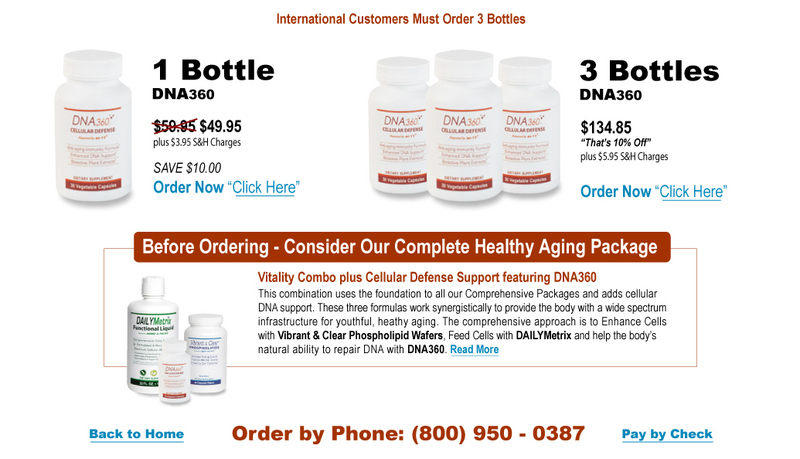 Resale of DNA360 without written permission is strictly prohibited.